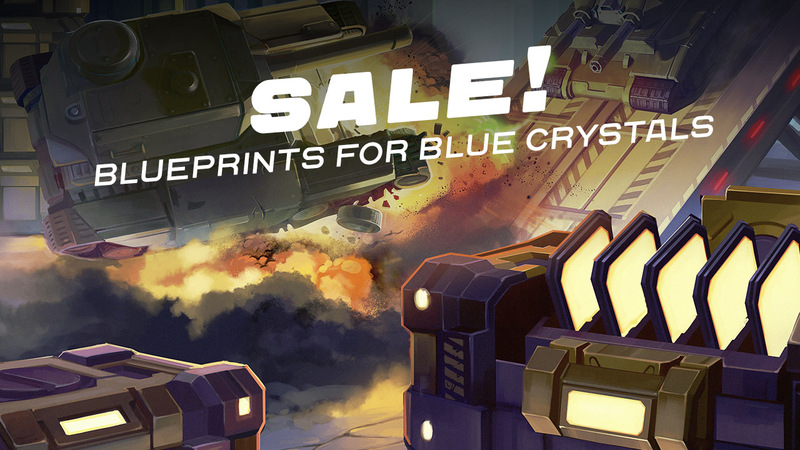 Do you have a lot of blue crystals, but not enough blueprints? This week is a great opportunity to upgrade! You can make a purchase for only 1 container, the sale will end at 21:00 UCT on March 31. “Hammer” – reduced spread, reduced damage from 63 to 58 per pellet. “Firebird” — the time consumption of the cylinder was increased from 3.5 to 4 seconds damage reduced from 530 to 517. “Freeze” — cylinder cooldown reduced from 8 to 7 seconds, damage reduced from 492 to 483. “Shaft” — increased the speed of rotation of the tower in sniper mode from 25 to 30 degrees per second. “Smoky” — reduced damage from 338 to 325. “Twins” — increased damage from 90 to 95 per projectile, increased projectile speed from 130 to 150. “Ricochet” — increased damage from 280 to 294, reduced projectile speed from 120 to 110. Nicknames in observer mode now appear at any distance. We fixed issues with bloom on low graphics settings. We fixed the incorrect colors of some containers.